Making the call to schedule your annual HVAC maintenance may not be the highlight of your season, especially during the hectic holidays. But it sure can save you time, cash, and discomfort later, and that makes it worth remembering. In particular, taking the time to schedule your air conditioner and heating inspection and maintenance each year provides four specific perks you can’t get any other way. Now that we are headed into the coldest part of the year in earnest, it seemed like the right time to share why maintenance for these two major appliances isn’t something you want to put off! As Canadian Homeowner reports, there are seven major causes of home fires. Guess what two of the most common causes of home fires are: electrical and major appliances malfunctions! Just across the border, the U.S. National Fire Prevention Association (NFPA) reports that heating equipment causes 16 percent of house fires and 19 percent of fatalities from the same. Failure to clean and maintain major appliances like heaters, as well as failure to clear adequate open space between heating appliances and flammable furnishings, is directly implicated in 30 percent of home fires. These are some scary statistics indeed! But here is the good news: you can drastically reduce your risk of enduring a home fire just by scheduling your furnace’s annual inspection and maintenance appointment. Your technician will clean and inspect your heating equipment, make minor repairs and adjustments with your permission, advise you on any safety risks, and answer all your questions about home safety during fire season. While it is easy to miss the signals, your furnace typically does its utmost to warn you in advance of an impending breakdown. Noisy cycling on and off, rusting, rumbling and grumbling, rust, leaking, and thermostat inaccuracies are just some of the warning signs that your furnace is headed for an outage. Vacuum out your air registers, exhaust vents, and warm/cold air return vents. Have your dryer vents professionally cleaned. Clearing away clutter or debris that can block air registers and vents. Schedule maintenance for your heating equipment. Just as you have to work harder to run up a hill than to run back down it, so too does your furnace have to expend more energy to keep your home warm when it is working against a clogged filter, blocked vents, worn out mechanics, or leaking parts. The fewer obstacles placed in your furnace’s way, the less energy it will draw to produce the same amount of heat. This translates to greater energy efficiency AND more money back in your pocket—and at a time of year when most families need every extra cent they can save! It can be challenging to believe a simple inspection and service call can actually save you money! Nevertheless, it is the truth. By cleaning the exterior and interior of your furnace, maintaining and repairing worn, loose, or broken parts, testing performance, measuring thermostat accuracy, and ensuring connection safety, your technician ensures that your furnace is ready to deliver peak performance all winter long. The cold season has earned the nickname “cold and flu season” honestly. As temperatures plunge, humidity levels often follow suit, and before you know it, everyone in your family is sniffling and sneezing. Add to the already circulating cold and flu germs the airborne toxins from wood-burning or gas stoves and fireplaces, dust and debris from dirty vents and air ducts, firsthand or secondhand tobacco smoke, pet dander, and artificial, chemical fragrances from holiday air fresheners and candles, and what you have is a recipe for months of feeling under the weather! One of your furnace’s main jobs is to trap airborne allergens and toxins before they enter your home’s air duct system and get carried to every room in your home. But your furnace can only do its job well if it has a clean air filter and clean air ducts to work with. Otherwise, there is little your furnace can do to keep you from getting sick again and again. 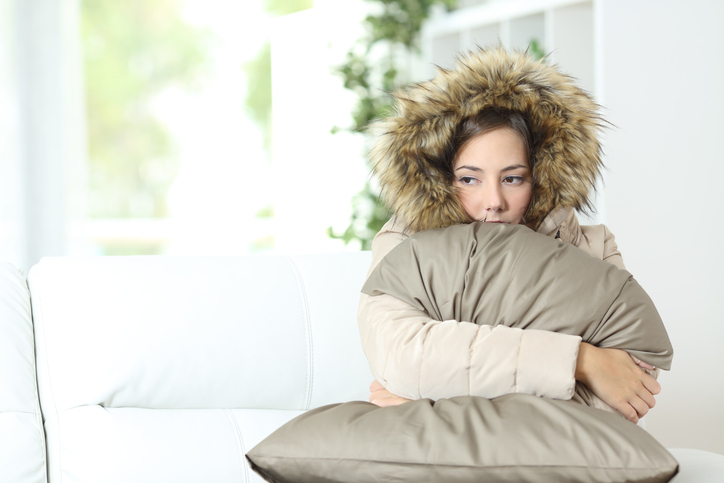 Here, changing your furnace filter at least monthly, dusting and cleaning your vents and registers, and having your air ducts professionally cleaned can give your immune system a head-start on the winter’s germs. Adding back valuable humidity to your indoor air through the use of a portable or whole home humidifier can also help your body fight off germs and allergens more successfully. Shipton’s Golden Savings Scratch & Win Event Is Going On Now! Right now, with Shipton’s Golden Savings Scratch & Win Event, you have the chance to save up to $1,000 on your purchase of any HVAC units! Just complete this simple online form to confirm your participation. Breathe Clean Air & Save 20 Percent! Our Breathe Clean Air Event is still going strong! Purchase any whole home humidifier, ultraviolet light purifier or media air cleaner and save 20 percent on the purchase price! Reserve your 20 percent discount now by completing this simple online form. Here at Shipton’s Heating and Cooling, we want your holidays to be merry and bright. But even more, we want to be sure you and your family stay healthy and safe all winter long. Don’t forget that we offer 24/7 emergency repair service, including nights, weekends, and holidays! If you need us, we will be there—guaranteed. Just give us a call at 905-549-4616 or bookmark this page for urgent repair needs.